Our clear summer nights offer up great opportunities to gather ’round the family and neighbors to spot some easily seen man-made satellites. We spent this evening with our neighbors and their young children watching our local overflight of the International Space Station; instant awe! 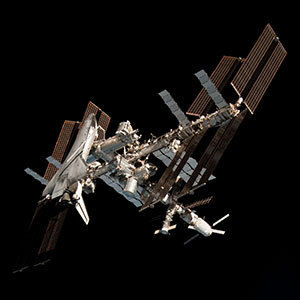 One of the most easily seen objects in the night or early morning sky is the International Space Station. Traveling at 17,000 miles per hour, the ISS is generally one of the brightest objects in the night sky and easily seen with the naked eye making it an excellent opportunity to introduce even quite young children to sky watching and the concept(s) of space and how close “space” really is; after all, if there was a road, you literally could drive there in a day.